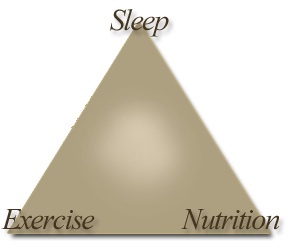 Mom's basic needs: Sleep, nutrition & exercise! Do you remember what it was like being pregnant? Whether you loved it or hated it, you probably treated your body like the temple it is. You probably made sure you ate properly, exercised routinely and got plenty of rest. And then your bouncing baby was born and in all likelihood, your dedication to nutrition, exercise and ample sleep went out the window just as your bundle of joy came through the front door. Why is this? Why can’t we continue to give ourselves the care we deserve once motherhood arrives? Don’t get me wrong, I know there are extremely valid reasons for why we put our own needs on the back burner; we do this, of course, because there is a small new life that requires love, feeding and attention, 24/7. Those first few days, weeks, months are a blur. Your baby mixes up days and nights and, at times, you might too. Sleep as you knew it becomes just a dim, fond memory. Exercise is impossible when energy is low and time is sparse. As for nutrition, well, if you’re anything like me, you start to think that a few cookies and some coffee suffice as a meal. Not good, right? Then suddenly those months become years. Your kids are sleeping through the night and so are you; although given your daily demands, eight hours of shut-eye are probably a rarity and six hours or less may be the new norm. Why? Because your days – and nights – are busier then ever; there are school conferences, soccer practices, ballet lessons, playdates and bake sales. There’s homework to check, emails to return and forms to fill out. Dinner is often on the go; despite your best efforts, a few nuggets before the game may suffice for what was once a sit-down meal. As for exercise, well, does running to the car count? Honest answer: no. This is all just no good. And recently, the pressure of juggling these ongoing obligations along with an intense job, frequent writing, five feisty (and frequently sick!) kids and the pressure of the holidays really got me down. I was sick. Physically, I had a nasty upper respiratory infection that migrated to what I think was a strain of the flu; that’s the only explanation I have for why I spent most of Monday in the fetal position battling chills and nausea while my hacking cough prevailed. Emotionally, I was a wreck. Angry. Sad. Overwhelmed. Nasty to my husband. Short-tempered with my kids. Isn’t this supposed to be the “happiest time of the year?” Well, it should be. And, I believe it can be. If we all give ourselves the gift of rest. The permission to say no. The latitude to tuck in early or sleep in late. To skip the bake sale because you’re going to the gym. To just say no to nuggets and make sit-down meals a staple once again. You deserve it. We deserve it. And, just like that time your newborn first slept through the night, you will realize how much better the world looks when you’ve had a full night’s sleep! I finally took the time to get into your blog. Loved it all. I will save it in my “favorites.” That way I can check it on a regular basis……if this OLD computer continues to behave. I guess I could be checking it on my iPad though.